Uglyworld #72 - Jeero Learns A Crucial Lesson, originally uploaded by www.bazpics.com. 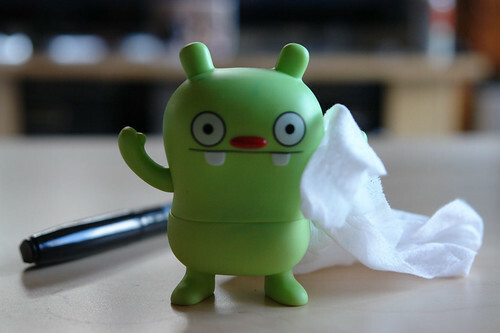 Jeero was messing around today with some pens and pencils and ended up learning a very valuable lesson. He had been drawing on himself and then wiping it off again with a damp wipe, but he went one step too far when he picked up the permanent marker and used it on his own head - no matter how hard he wiped there was no chance of it coming off again, so now he's going to have to live with the marks for the rest of his life.